Choose at least one activity to complete your Digital Citizenship Week lesson! Watch this short BrainPop Video about Digital Etiquette and have students either take a quiz individually or as a class. Use this lesson with younger students to have a meaningful conversation about what cyberbullying is and what they can do if they witness it. Use this lesson with older students to learn about the factors that lead to online cruelty and what they can do to lessen the effects of cyberbullying. In addition to completing at least one of the above activities, we encourage participation in our poster exhibition! 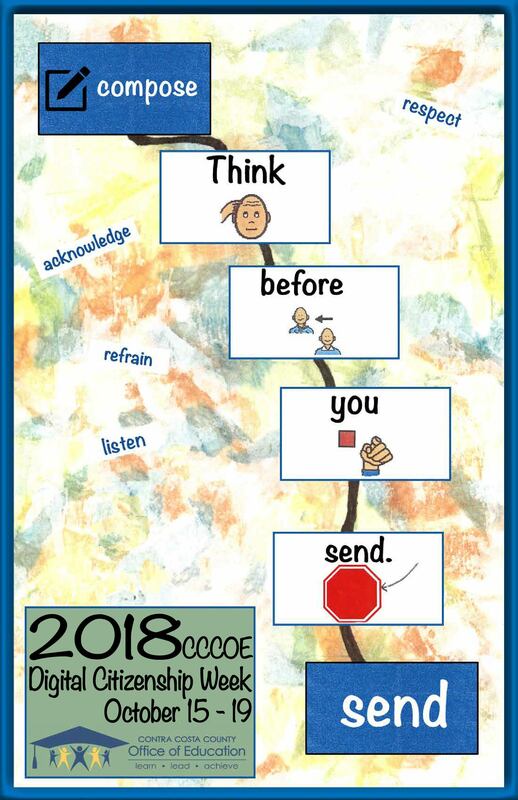 If selected, your submission could become the official 2018-2019 CCCOE Digital Citizenship Week poster! Use facts/slogans/illustrations to create a poster about one of the following topics. All participants will receive a reward for their efforts. Ensure that the title on your poster includes “2018 CCCOE Digital Citizenship Week”. If selected, your submission will be the official poster of 2018-2019 CCCOE Digital Citizenship Week. Posters can be completed on 8 1/2 x 11 paper, 8 1/2 x 14 paper, 11 x 17 paper, on Google Drawings, or another software program of your choice. Poster Topic 1 - Social Media (interacting with others) Appropriate and inappropriate use / how is it a good tool / problems if it is abused / cyber bullying / etc. Poster Topic 2 - Privacy (protecting yourself) Identity theft / privacy settings / how to protect yourself. Poster Topic 3 - Fair Use & Copyright Academic use / intellectual property / copyright / piracy / plagiarism / do's and don'ts. 3 Possible Points The selected topic, and "2018 CCCOE Digital Citizenship Week", is clearly labeled and clearly conveyed. The selected topic, and "2018 CCCOE Digital Citizenship Week", is labeled. Missing title. 3 Possible Points Selection of color(s), images and use of text attracts viewers and keeps their attention. Selection of color(s) images, and use of text somewhat attracts viewers but may not keep their attention. No color, images not present or are inappropriate. Poster does not attract viewers' attention. 3 Possible Points Text clearly and creatively educates viewer on the topic, and instructs the viewer on how to take action. No spelling errors. Text is present but lacks creativity, somewhat instructs the viewer on how to take action. No more than 1 spelling error. Text not present, not informative, does not show creativity, unclear message to viewer. 3 Possible Points Poster layout demonstrates a clear plan, effective use of space. Images and text work in harmony. Poster layout somewhat demonstrates a plan for effective use of space. Images and text need to be rearranged. Poster planning is not evident. Images and text are unrelated.